APNIC is VoIP-enabled, which means that anyone using VoIP hardware or software can call APNIC from anywhere in the world for free. The software package X-Lite is just one example of freeware you can use for this very purpose. The information here shows you how to configure and use X-Lite. Leave the Password and Authorization user name fields blank. Un-check the item Register with domain and receive incoming calls. 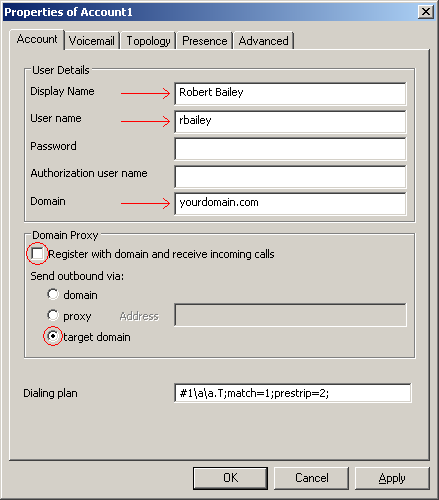 Under Send outbound via, select target domain. Ensure that the entry in the SIP Accounts list has the “Enabled” box ticked, then click Close. You are now ready to start dialling SIP addresses directly! You should also hear the ringing tone play as the phone rings at the other end. When the person at the other end answers, the message on screen should change to “Call established”. As long as you have your speaker and microphone configured correctly, you should be able to speak to the person on the other end just as though you were making a normal phone call. 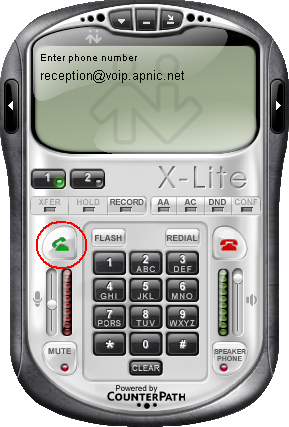 To end the call, press the Hang-up button (red phone on the right hand side of the X-Lite main window). Once the call has been ended, the message on the display should change to “Hung up”. If the sound does not behave as expected, it is possible that you need to configure your speakers and microphone. Please see the section X-Lite Audio Configuration for instructions on how to do this. If the sound does not behave as expected when using X-Lite, it is possible that you need to configure your speakers and microphone. Click the Show Menu button, and choose the menu option Options… This will show the X-Lite Options window. On the left hand side of the Options window, click the button labeled Devices. This will show X-Lite’s audio configuration options. Here you can configure what audio devices X-Lite will use, as well as a number of other audio related settings. In some cases when you are connected to a network that is behind a NAT (Network Address Translation) device, X-Lite can have problems connecting. Some of these problems can be resolved by using a STUN server (Simple Traversal of UDP through NAT). STUN works by sending communications between your computer and a server on the internet, to try and detect what type of NAT device your network is behind. 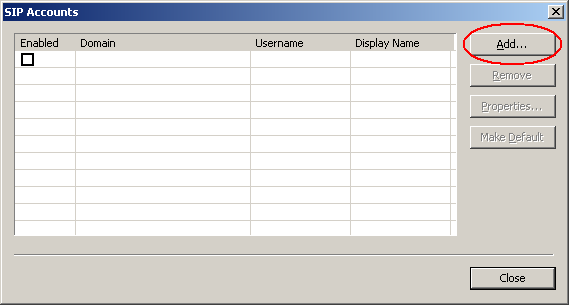 On the X-Lite main window, click on the Show Menu button, then choose SIP Account Settings. This will show the SIP Accounts window. 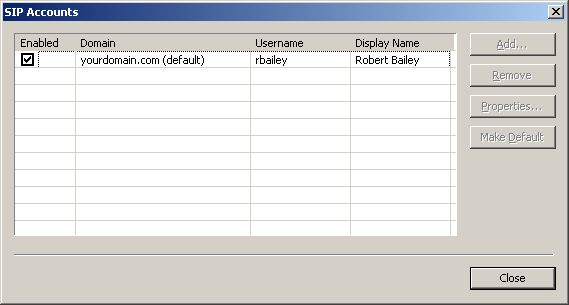 In the SIP Accounts window, select the account you created previously, and click Properties… The Account Properties window will appear. Where it says “STUN server”, select the option Use specified server, then type “stun.counterpath.net” into the field next to it. stun.counterpath.net is a freely accessible STUN server, provided by Counterpath to assist X-Lite users who are behind NAT devices. Click OK, and then Close to close the SIP Accounts window. You have now configured X-Lite to use a STUN server.